Much of our work in fish ecology and conservation revolves around understanding the tradeoffs fish face by occupying alternative habitats. For migratory fishes we would like to know how a given environment influences key attributes like growth and survival. Ideally, we could compare growth and survival among habitats. However, measuring these attributes is laborious, often requiring extensive tagging and recapture to identify individuals through time. For numerous, highly mobile species, recapture rates of tagged individuals are often dismal. Therefore, a single capture method to measure growth would allow huge advances in our understanding and comparison of habitats. Until recently, a single capture growth measure remained elusive. Recent advances in blood plasma hormone assays allows us to measure the hormone directly responsible to stimulating cell division and somatic growth, insulin-like growth factor 1 (IGF1). IGF1 has a number of roles, and is also involved in maturation, masking its growth effects in maturing fish. However, in immature fish numerous laboratory studies have demonstrated the efficacy of plasma IGF1 concentrations as a proxy for recent growth (primarily in fish length). In facultatively anadromous species (e.g. cutthroat trout, bull trout, Dolly Varden, brown trout, etc. ), that is, those that may vary widely in age at ocean migration, or may exhibit partial migration, we often wish to understand the growth potential of going to sea compared to staying in freshwater. In this study, we compared plasma IGF1 concentrations of fish captured in three estuarine sites with fish found in river and lake habitats. We also used otolith (earbone) chemistry to identify differences in residence time at different locations. We were surprised to find different growth rates among estuarine locations. Dolly Varden are highly mobile fish capable of moving among these locations in a matter of hours (most are just a few km apart), yet otolith chemistry indicates these fish remain near their site of capture for at least several weeks. Moreover, these same sites become de-watered at low tide, so fish must repeatedly move into each site at high tide. Less surprising was that growth in estuarine environments was higher than lake sites at nearly all month-site combinations. However, there was no site effect in the lake, with equally low IGF1 at all sites. Finally, we found that fish found in the river between the lake and estuary were of recent freshwater origin, with low growth, early in the season; gradually shifting to fish of likely ocean origin, with higher growth, later in the season. In summary, this is one of the first studies to use IGF1 to measure growth in a wild fish, and demonstrates both the fine-scale residence and growth differences in an estuarine fish. It’s hard to appreciate just how many small streams, many unnamed, exist along the Alaska Peninsula. Dolly Varden are known to be early colonizers of these streams following deglaciation. However, Dolly Varden life histories often seem paradoxically unsuited for very small coastal streams. 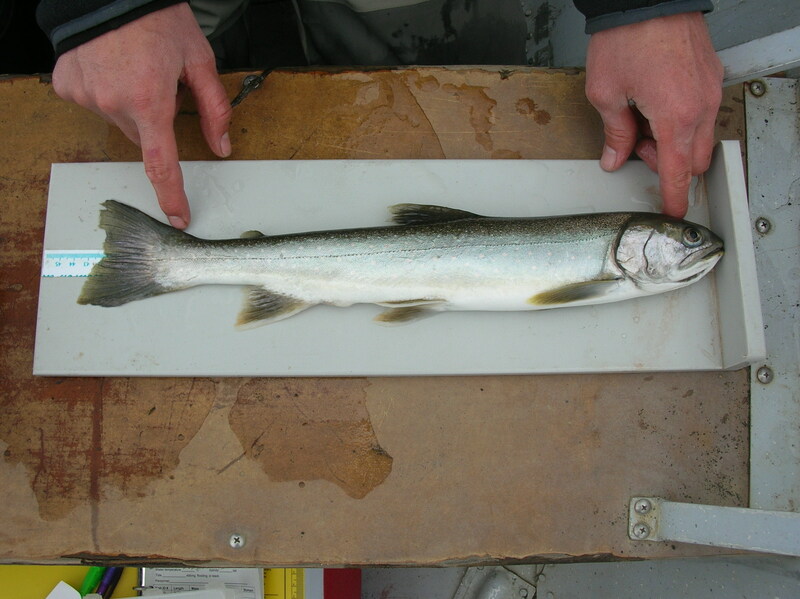 Dolly Varden, like many other char, head to sea for the first time at a fairly large size compared to other salmon. This means that they might rear in freshwater for several years before achieving a large enough size to smolt. So, very small streams may become inhospitable in winter months as flows decrease or waters freeze. In streams that drain to lakes, young Dolly Varden fry can move into the lake, or through it to a larger stream. What do Dolly Varden do in the myriad small streams that drain to saltwater? Spit Creek from the ground at low tide. Spring flows are around 40 cfs. Whalers Creek, draining into Chignik Lagoon near Hume Point. Dolly Varden fry were also found here. We hypothesized that Dolly Varden in small streams draining to saltwater might be adapted to smolt, or tolerate seawater, at the end of their first year of life, as streams dry or freeze in winter months. Although we did not have the capacity to directly measure this, we electrofished several small streams and found Dolly Varden fry using these habitats. Electrofishing Waterfall Creek (our name). There is only about 100 m from the high tide mark to a large waterfall (impassable), yet we found young Dolly Varden fry here. Two lines of evidence support our hypothesis. First, streams draining directly to saltwater were genetically distinct from those draining to lake or large river habitats. The level of distinction was surprising given that some lagoon streams are only separated from freshwater streams by 5 km or so. Second, we didn’t find the larger, older Dolly Varden that one might expect if they were rearing in these streams for multiple years. More work is needed to know what exactly is driving the patterns that we have observed, but there is a strong implication of alternate life histories in lagoon streams have led to the observed genetic isolation. 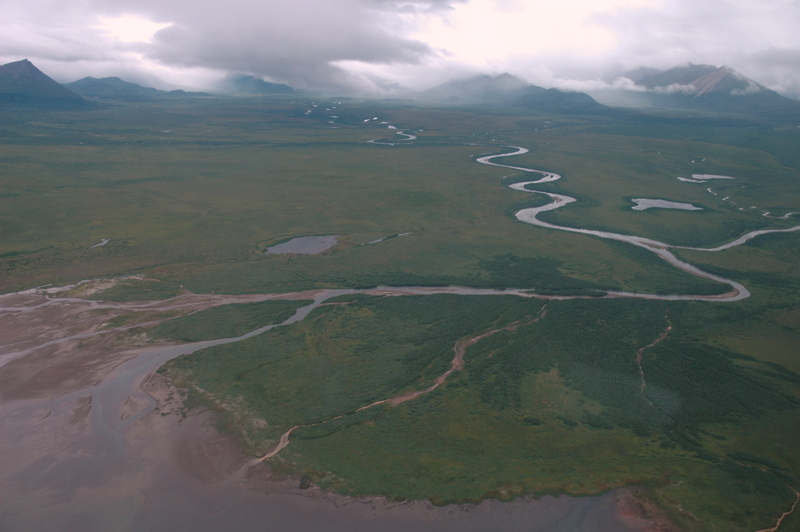 These processes may be prevalent outside of Chignik, as many, many, small streams dot the coastline throughout Southwestern Alaska. If you have journal access, see the paper here or e-mail me for a reprint. As part of our research into the diversity of anadromous behavior in Dolly Varden, we initiated a study of Dolly Varden movements (mainly ascent into freshwater in summer and fall) on three different spatial/temporal scales. First, we used acoustic tags to identify when fish were moving from lagoon to fresh waters in the Chignik system (see photo below). We found a very bi-modal distribution, with some fish entering freshwater in mid-summer, shortly after tagging. A second group of fish entered as late as November. A second aspect of the study involved comparing upstream migration timing in the Chignik system to that of other watersheds throughout Alaska. In many watersheds weirs (see the Chignik Weir, the largest in Alaska, below), acoustic counting stations, or fish wheels are used to enumerate upstream passage of salmon. Sometimes Dolly Varden are also counted (Sadly, Dolly Varden are not counted, or are counted but never entered into databases or published in many watersheds where monitoring occurs) and we can learn something about the median date of upstream migration in those systems. It turns out that although there is a general latitudinal cline in migration timing, with fish in higher latitude streams returning later than those in low latitudes. This may be because at low latitudes fish enter coincident with salmon for egg/flesh feeding opportunities, while at high latitudes they remain in marine waters for feeding for as long as possible. An additional analysis of the few streams that we have long-term data for indicate that nearshore ocean temperatures are correlated with variation in return timing. In systems where fish return before the peak temperature, warms years tend to drive fish upstream early, while in streams where fish return after peak temperatures, fish tend to return later in the warm years. Together these analyses paint a clearer picture of the complex migratory patterns of Dolly Varden that Bob Armstrong labeled as the “manager’s nightmare” in a 1984 paper. The Alaska Salmon Program has been working in the Chignik Lakes watershed in Southwestern Alaska, for over 50 years. Each summer a few graduate students and technicians make Chignik Lake their home for three months while they conduct research related to the fish and environment. In 2008 I started a new project that I hoped would explain some of the curious migratory behaviors of Dolly Varden (Salvelinus malma) in the Chignik system and elsewhere. Dolly Varden in Chignik are anadromous, meaning that they are born in freshwater and eventually move to the ocean for feeding and growth. Dolly Varden are thought to move to the ocean in their third or fourth year of life, and only remain there for the summer months, returning to freshwater to overwinter. In the June of 2009, we were investigating one of the main sockeye salmon spawning tributaries in the Chignik watershed, the Alec River (pictured), when we noticed something odd. There were lots of relatively large Dolly Varden in the river, exactly when we expected them to be at sea. Why were these fish in the river when they could be feeding at sea? Before salmon arrive, in August, there is not much to eat in the river, especially for these bigger fish. Our assumption was that we would only find young Dolly Varden (~6″) that were feeding on insects prior to their migration to the ocean. Oddly, there did not appear to be any small fish there, only larger (16″-20″), presumably older fish. In addition to being large and abundant, Chignik Dolly Varden in June were also really skinny (pictured). They looked like they were wasting away. A check of their stomach contents confirmed that they weren’t eating much. Fellow graduate student Jonny Armstrong has been thinking a lot about subsidies and movement of fish, so we teamed up to delve deeper into the Alec River Dolly Varden, and why they did not migrate when most other fish appeared to do so. We know that for many fish migrating to sea is a risky proposition, and fish only do it if the net benefits (e.g., size, fecundity, weighed against risk of mortality) of moving exceed those of staying. Maybe the Alec River fish had found a way to survive and reproduce year after year without going to sea? We did some bioenergetics calculations that just didn’t make sense. The only thing the fish appear to eat is salmon eggs, and they eat lots of them. During spawning Dolly Varden might have several hundred eggs in their gut at one time. The fish get obese during this time and gain a lot of weight. But, our calculations indicate that they would still run out of energy by the middle of the next summer; not surviving until the salmon return in August. Plasticity in gut size allows many organisms to change their energetic costs, a fact that has been well documented for birds and snakes among other organisms. We went back to the Alec River to see if changing the size of the gut was allowing large bodied Dolly Varden to survive the lean time between egg pulses, while maximizing their egg intake in the short time while salmon spawn. A closeup of the gut (stomach, pyloric caeca, and intestine) show that the gut doesn’t just stretch out to accomodate eggs, the digestive machinery has gotten much larger (2-4x larger in mass). So what does this mean for the fish? Once Chignik Dolly Varden get to be near their full adult size, it appears that they can use the flexible gut strategy to remain in freshwater, acquiring enough resources to reproduce and live until the next bout of eggs. It may be that other species have similar strategies to deal with pulsed resources, particularly eggs, in the same way. However, many watersheds do not have nearly the egg subsidy they once had because of a reduction in population size, or eggs ending up in hatcheries rather than streams.